Before I started Banting I was an overweight fairly lazy 49 year old father of a wonderful ten year old boy. my only exercise was on a Sunday when i took him to Nipper training and helped out for two hours. I had grand intentions of doing hikes every other weekend and cycling with my son but they all came to naught. I heard about a low carb high fat diet in October/November 2013 and half heartedly tried it and within two weeks i was getting remarks from some of the moms at my boys school that were quite encouraging, however holidays and Christmas came along and that was the end of lchf for me. 2014 went by and the kilos piled on particularly in the winter. My son took to calling me globe belly and he would rub it, like rubbing Buddha’s tummy. We went back to nippers in September last year and during one of my many chats with the other parents, one mom told me she was going to do the Life Guard course starting in January 2015 and encouraged me to give it a go. After much deliberation (about 15 seconds) I said why not. During the festive period various friends of ours mentioned Banting and how it has benefited so many of their friends. So basically i started Banting and the Life Guard course at the same time. 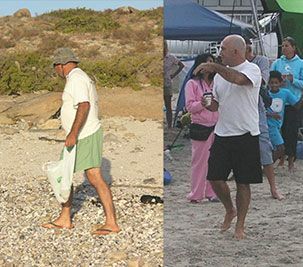 I started off as a seriously unfit and fairly overweight 49 year old couch potato and have progressed and transformed into a fairly fit, very enthusiastic potential life guard (final exam still pending – two weeks time) and regular ocean swimmer, we swim across Big Bay or Small Bay Bloubergstrand depending on conditions at least 4 times a week. A lot of my success can be ascribed to sticking to the Banting lifestyle, which was not difficult at all. Friends, family and acquaintances are all quite astonished at the transformation. My final comment on Banting is that it has really worked for me, I have kept an open mind and listened to the detractors, done further research on their point of view and every single one has come to nothing. I am a firm believer that Banting is the way to go for most people. Most of the people that have said that it does not work for them, are not doing it properly, I have spoken to a leading professor who is an authority on Diabetics and he says “of course it will work for weight loss”. and my own GP has said that he has had very positive feedback from his patients. Both the Prof and the GP are not proponents of Banting , favouring rather the Balanced or Mediterranean diet, but have both confirmed for me the science behind the Banting theory. I had my regular biannual medical check-up about a month after starting and my blood results and cholesterol levels were all good.